Planting in a garden container can be fun and easy to do. We offer a few tips here on how to make it a complete success. 1. Give potted plants the conditions they need. 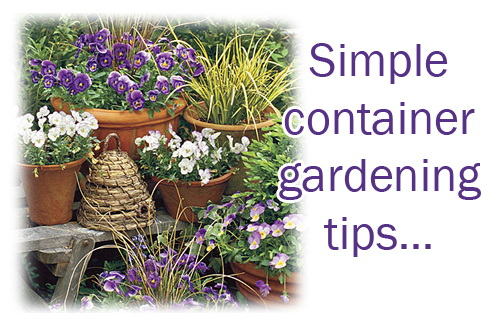 Assess the site for your containers as you would for an in-ground planting. Does the area get full sun, filtered shade, or deep shade? Choose plants accordingly. Is the area sheltered or exposed to lots of wind? If it's exposed, you will need to install a trellis, windbreak, or other protections before putting your pots there. 2. Use foliage plants lavishly. They add structure and form to the garden and are a good foil for flower display. They also create a point of interest in shade, especially when you use glossy leaves that catch the light, or ones with white or yellow markings. 3. Choose containers to match the style of your house. Try not to mix too many themes and stick to one idea. Remember that terracotta clay pots are low fired and will absorb the water you use. They will dry out faster than a ceramic or high fired pot so take that into consideration when selecting the type of materials the pots are made of. Concrete or poly resin are both very durable and almost indestructible. Dark colored containers will absorb more heat than light ones. 4. Pay attention to watering - the single most important step of container gardening. If you have many pots, make it easy by trying some of the following devices. A hose end nozzle with an off-on lever allows you to turn off the water between containers. Long handled watering wands attach to garden hoses to extend your reach, they are perfect for hanging pots or pots in the middle of a large grouping. Drip irrigation, which is a micro irrigation system that delivers water to containers through a network of thin tubes. Automatic times work great also.